The road to weight loss, although fulfilling, can get frustrating often times. Whether you’ve tried all the latest diet fads or purchased the coolest gym membership, getting to your target weight is going to be difficult if you don’t take a closer look on your metabolism’s current state. Getting to know your metabolism is the first step to weight loss. Have a regular sleep schedule and stick to it! Sleep deprivation makes you “metabolically groggy” according to a University of Chicago research. If sleep-deprived, the body cannot process insulin properly and when the body doesn’t respond to insulin, it ends up storing them as fat thus contributing to weight gain. So how do you exactly start a regular sleep schedule? Begin with the standard 7 hours a night and make sure you’re setting a realistic bedtime for yourself. Work in 15-minute increments each night for a smoother transition into the schedule. Also be consistent - dim the lights when it’s time to rest and don’t hit the snooze upon waking up. If it isn’t obvious, going organic with your diet helps a lot. The pesticides and other chemicals used in farms and non-organic foods can alter your metabolic rate which will make you inevitably gain weight. Along with organic produce, also try to incorporate spices into your meals like cayenne and cinnamon which has been proven to enhance metabolism. While you’re at it, increase your intake of omega-3 fatty acids. 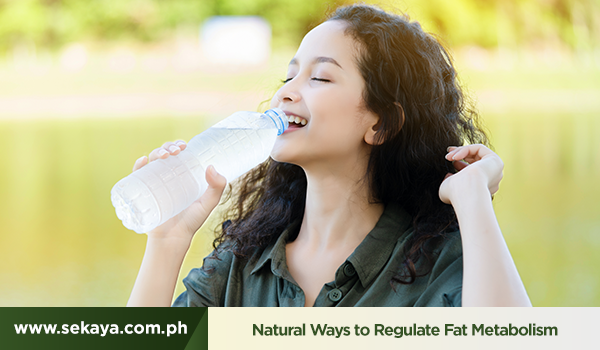 Omega-3 increases fat-burning enzymes in the body and lower levels of stored fat. You can get it from salmon, walnuts, canola oil, sardines, and many more. There are lots of tea variants with varying effects to the drinker. It has been proven that some teas like oolong tea include a flavonoid called catechins which boosts metabolism. Pu-erh tea is also considered to be one of the most popular beverages in Asia for its medicinal and fat-burning functions. Try Sekaya’s Pu-erh Trim Infusions. It carries high levels of polyphenols which enhances metabolism and eventually assists in melting fat.